It really feels like spring might finally be here. I can't wait for all the juicy berries and fruit of summer. In the meantime, it seems I've had my fill of apples and pears. And despite the grim news last month about the citrus crop in California, I sure haven't noticed a whole bunch of difference in the quality or price of citrus here. I can still get great big ruby red grapefruit and bags of lemons for the usual price. In fact, since I'd virtually without fail choose citrus over apples, I'm pretty happy to hang on until summer's bounty starts to appear. For some reason this weekend (maybe the touch of spring?) I felt like baking and, although I LOVE chocolate, I really wanted something fresher and crisper tasting. After perusing the gourmet magazine collection at the local grocery store, and feeling not even remotely inspired, I decided that a citrus-y layer cake was in order. Just the thing to celebrate the first warm-melty days of spring. 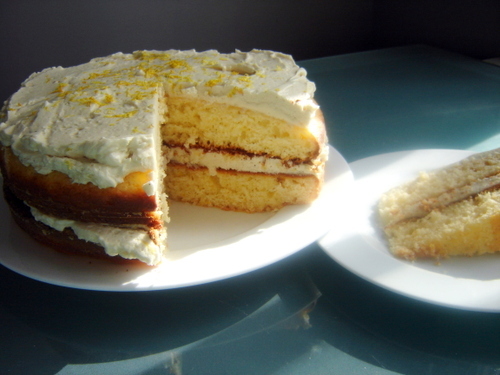 This cake is REALLY lemony. We keep our cakes in the cupboard, not having a cake dome, and having 2 cats. Every time I open the cupboard I am greeted by a waft of sweet lemon fragrance. Pure heaven. So far, the cake has been around for almost 36 hours and we have only managed to scarf down 1/3 of it, which is pretty restrained for us.... The icing I used is a variation on another icing I have done. I really prefer it to traditional icing recipes which I find far too buttery and cloying. I imagine you could adapt this to just about any flavour as the recipe is essentially equal volumes whipped butter and cold custard. It's incredibly creamy without being greasy or sugary. Is spreads like a dream and sets up nicely. Due to the milk content it really does need to be refrigerated. Grease and flour 2 8-inch round pans. Preheat oven to 375F. Cream together zest, sugar and eggs. Beat on high speed. Add butter and continue to beat for several minutes. Beat in citrus juice. Beat in milk. Sift dry ingredients together. Beat until just combined. Spread batter (which will be on the thicker side of cake batter) evenly into 2 pans. Bake at 375F for 20-23 minutes or until a toothpick inserted in the centre comes out clean. Cool in pans for 15 minutes and then remove to plates to continue cooling. I put mine in the freezer for 10 or 15 minutes to completely cool as I can't stand waiting! In a small saucepan combine milk, sugar, flour and egg. Beat with an immersion blender until completely blended and smooth. Place saucepan over medium-high and add lavender. Heat for 5 minutes. Strain out lavender. Return to heat, whisking frequently until mixture starts to bubble vigorously and thicken. Continue to cook, whisking continuously for a further 90 seconds. Remove from heat and set saucepan in a cool water bath. In your stand mixer, whip butter for 5 or more minutes until very pale and fluffy. While butter is whipping, whisk custard in water bath to cool. Once custard is cool to the touch, whisk in vanilla and 1/2 teaspoon lemon zest. While the mixer is running, dollop spoonfuls of the custard into the whipped butter. When it is all incorporated, whip in icing sugar. Divide frosting into 2 portions. Use one portion to sandwich between the layers, and the second portion to spread on top. Sprinkle top of icing with reserved lemon zest. This recipe looks great. I just bought some lavender sugar, so I was looking for a recipe for cupcakes I could make to sprinkle with some of the sugar. This sounds scrumptious. As for the sponge pudding--isn't it cool when people all over the world fall in love with an old family recipe? Sharing these treats is one of the best benefits of blogging. This looks divine, with all that butter the frosting must be delicious! mmm...I love citrus cake. My grandma used to make an amazing lemon-poppy seed version that I loved. With spring on the way, I also feel like the crisp acidity of citric fruits is refreshing and exactly what I need. if I were to make those into cupcakes...how long would I have to put them in the oven for? i've never craved sweets in the morning.... until i saw this cake. wow -- it really looks tasty. i adore vanilla and citrus. creamsicles are my fav!